I'm finally recovered from my long weekend. When others decide to go relax and rest somewhere, I feel the need to explore and work. See, my partner in Crime and Volunteering aka Consuelo and I don't know how to be still. 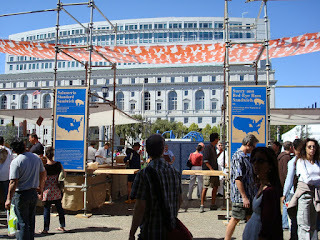 This is how we found ourselves volunteering with the farmers at the Civic Center Slow Food Nation event last Sunday. Nope, it wasn't the Pavilion with the expensive punch card for tasty treats but a bustling organic market, slow food court and urban garden filled with amazing people and their equally amazing goods. Consuelo and I arrived via Bart, checked in, signed our waivers and tied on our aprons to get to work. I'm giggling as I write this since Consuelo chose to go to the Straus Creamery booth and was basically sentenced to hard labor. She was instructed to fetch yogurt and milk samples from the refrigerated semi-truck that equaled a short hike to and climb into the truck each of the three times she was sent (correction, she informs me it was more like 12 times!). I was given to Paul of Hain Walnuts where I packed and sold organic walnuts for a few hours. Consuelo would text me to tell me what she was doing and didn't believe me when I told her my duties. She later showed up at my booth after I sent my farmer on a break after he discovered that I had grocery and market booth experience and could run his gig on my own. Consuelo was munching on a delicious Muffaletta sandwich with green olive tapenade and salami from the "slow on the go" food court. We wound up buying a second one later because it was so good. Back to the nuts...I appreciated that my farmer and I chatted about our respective businesses while we worked. Paul told me the history of his farm and details about his walnuts. He went organic years ago when his walnut orchard was in dire straits and he figured what did he have to lose. Turns out that the little town a few miles away from Hollister has a Mediterranean climate and responds well to no pesticides. His walnuts are sweet with no bitter aftertaste from last season. The best way to store nuts if you aren't going got eat them right away is to refrigerate for a few months or freeze for up to nine months in an airtight container in either case. This year's crop are still on the trees and will be harvested in early November '08. Paul also raises free range chickens and eggs on his farm and I might just need to leave Oakland one day to visit. He has also promised to send his mother-in-law's flour tortilla recipe that uses walnuts too. The end of the day approached quickly and Consuelo and I managed to scarf a bowl of the organic Three Twins ice cream that always had a line next to my walnut booth. 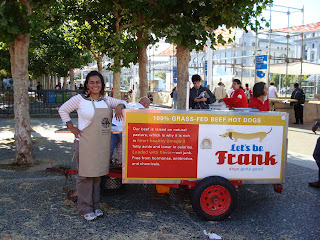 We also shared a all beef Let's Be Frank hot dog with grilled onions, dijon mustard and ketchup and Consuelo thought that was just the best name ever for a hot dog company. We helped break down a few more farmer booths including a raw honey booth and some of the most delicious organic peaches from Los Angeles. 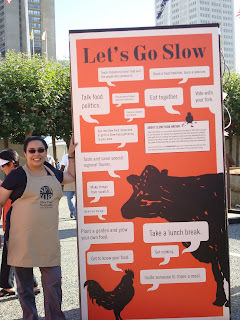 See this was some of the best slow food from all over the country as far away from New York but we here in the Bay Area and California had a strong presence at this event. What I took away from this day was how important it is to support farmers doing the right thing. This isn't just about the buzzwords of 2008 like slow, green and sustainable. This goes beyond organic, local and eco-friendly. I'm always talking about the history of my family and how things and the world used to be. We NEED to return to the days before pollution, chemicals and other engineered creations that nature never intended became the norm. We NEED to become more healthy as individuals, families, communities, countries and the world. Here's the most important part of all. This NEEDS to happen on all levels so safe, affordable, great tasting food is accessible to EVERYONE regardless to who or where you are from anywhere from rural to urban, wealthy to economically depressed and every spot in between. Consuelo ROCKED the Straus booth. We couldn't have done it without her and we appreciated all her hard work, going back and forth to the truck and giving me a much needed break after 2 days of getting up at 5:00am. Thanks again Consuelo! I'd like to give you some free Straus coupons for helping us out..you know to make up for the hard labor and all:). Go to our website www.strausfamilycreamery.com and email us and send me your address and I will send them to you.